At this point in the piece, I sat back and took stock. 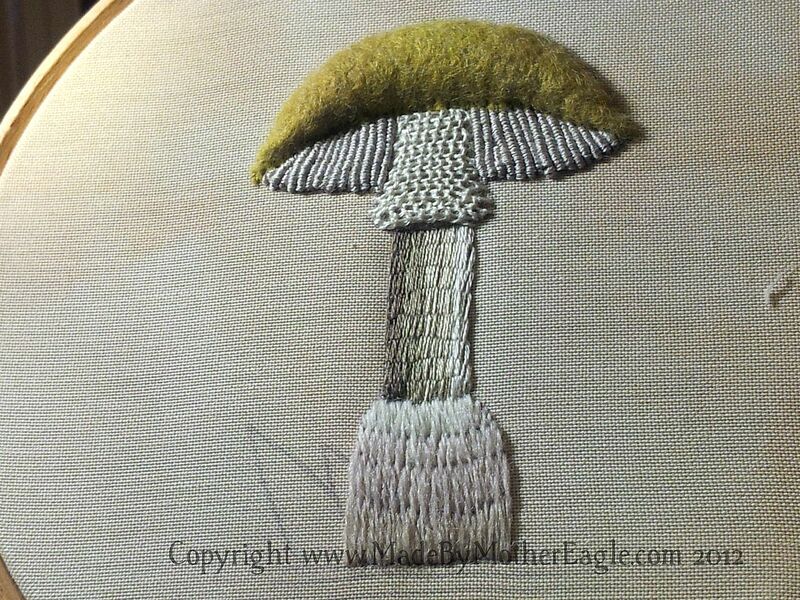 I realised that what at the start looked like a nice gradiation of colour in the initial panel of raised stem stitch making up the stalk, within the whole composition it now looked a bit crude; the colours are in fact not closely matched enough, so it looks a bit stripey. Also, the idea behind shading it in this way was that it would mimic a natural light source falling on the toadstool. But as I haven’t used darker colours anywhere else, it started to look a bit odd. A choice was in front of me. Having read up on the history of Stumpwork I knew that originally in these kind of conversational samplers, no sense of scale or ‘natural rules’ applied; bees can be as big as houses and no need to apply the rules of perspective, light and shadow and so on. On the other hand, this is MY composition and I intend to keep it alongside my Fly Agaric, a piece I don’t mind admitting I am very proud of, but also one that is pretty naturalistic looking in it’s composition. 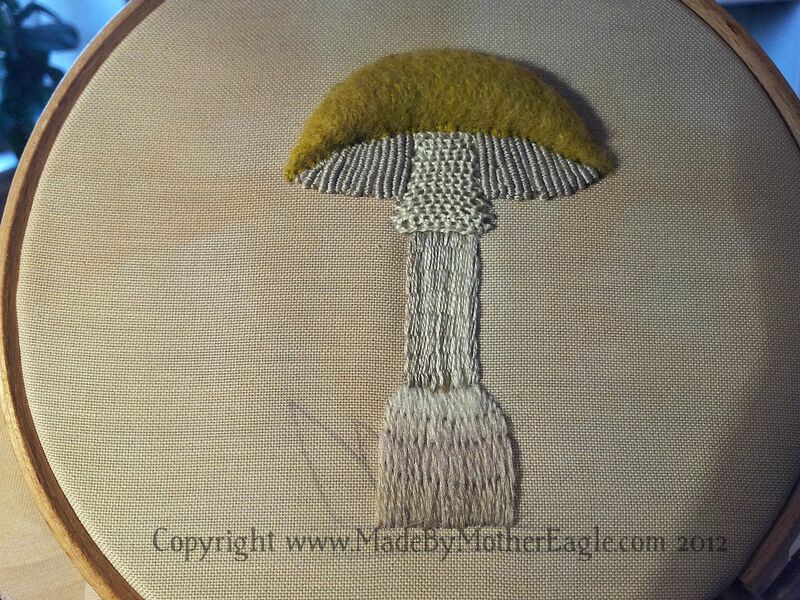 As this Death Cap will accompany it, representing my first attempts at mastering new embroidery techniques, I definitely don’t want to forever look at them and think ‘Balls, I wish I didn’t shade that stem so dark’. Time for a bit of a re – do. Luckily, the thing about this stitch, is the thread is only attached to the fabric as a starting stitch, the bulk of the surface thread simply woven along horizontal bands. So pretty easy to pull the threads out. I still didn’t want the stem to be a flat monotone though, so instead of working bands again, I threaded up 2 tapestry needles in the 2 lightest colours and worked them alternately, to give a much subtler gradation of colour, much less jarring than previously. I quite like the stem colours, but the palest cream seems to stand a bit proud of the rest, as though the thread is thicker. you could try to work some darker thread through the rest to tone it in a bit maybe?